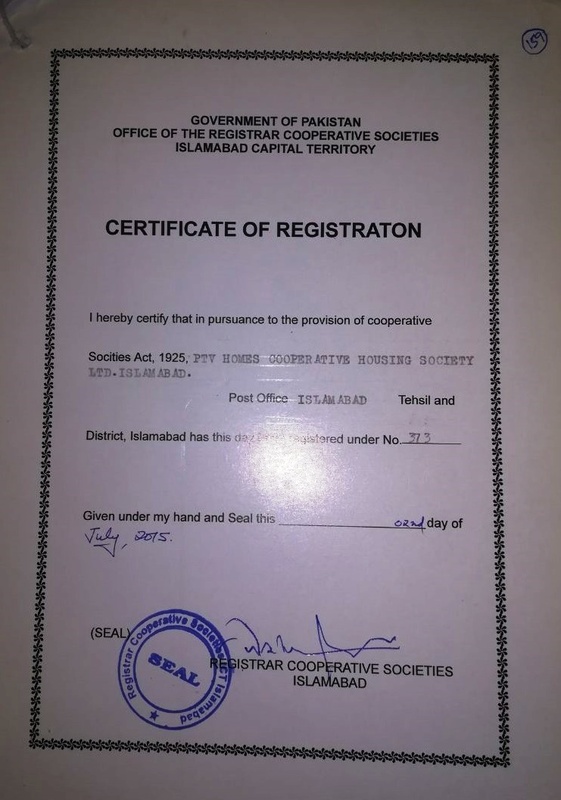 PTV Homes Co-operative Housing Society is registered with office of cooperative department ICT Islamabad under the Registration # 373 in accordance with the Co-operative societies Act of 1925. According to the society representative Mr. Muhammad Ismail Kalwar, the society is owned and run by PTV employees union in an effort to provide affordable housing solution to their fellow employees. This is the responsibility of the government and its institutions to provide homes to their employees, but employees union is doing their own efforts for the future benefit of their colleagues and their children. The person who worships Allah, receives heaven, and the person who serves the fellow humans, Allah will help him in his best interest. 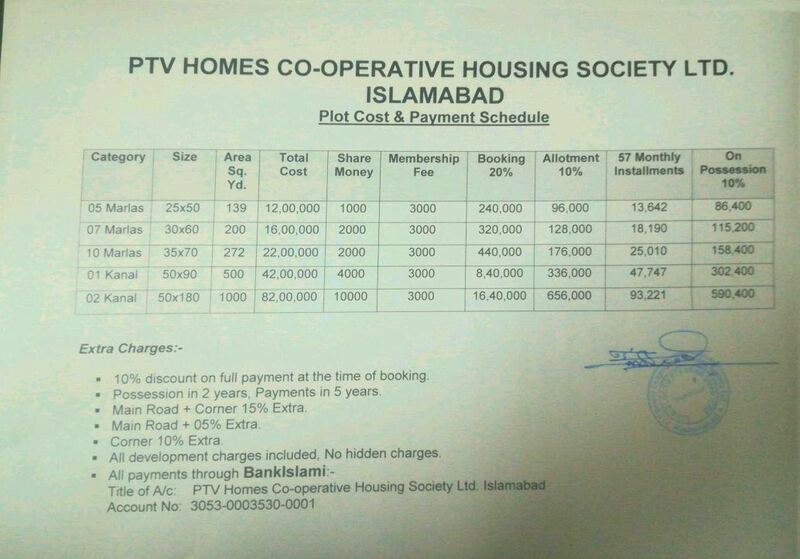 PTV has no relation whatsoever with PTV Homes Cooperative Housing Society. 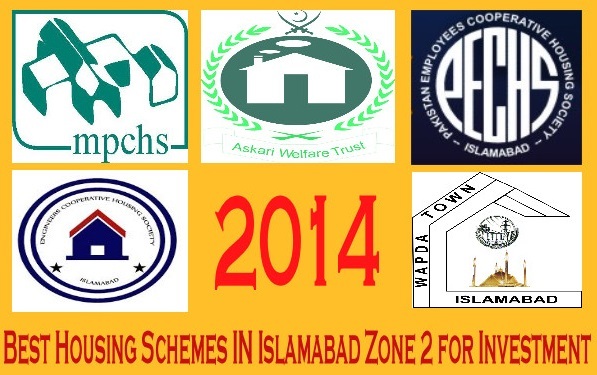 PTV shall not take responsibility of any loss to the general public caused by investing in the subject housing scheme. This public notice without any warning to the society implies that the society is valid and legal, however the institution doesn’t own it. 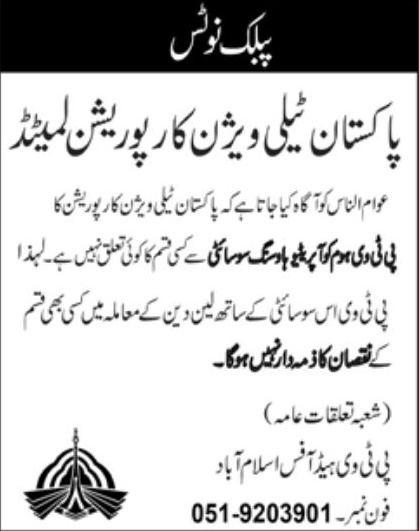 As mentioned earlier, it is owned by PTV employees union, there may be some internal rifts between the union and the management of PTV which caused the institution to dissociate itself from the society. 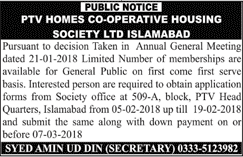 An advertisement was published by PTV Homes Cooperative Housing Society on 7th February, 2018 on Daily Jang, Page 4, which announced that limited application forms of residential plots were being given to general public on first come first served basis. General public could obtain the forms from 5th February, 2018 up till 19th February, 2018 from society office at PTV Headquarters, Islamabad, and submit the same along with down payment by 7th March, 2018. Currently, no more application forms are being issued by the society, but some dealers are selling such forms in the market at little profit. The society has also disclosed the total number of application forms issued to general public along with their specific plot sizes. There are total 841 members from general public, who have obtained 841 forms for 5 marla, 10 marla, 1 kanal and 2 kanal plots. 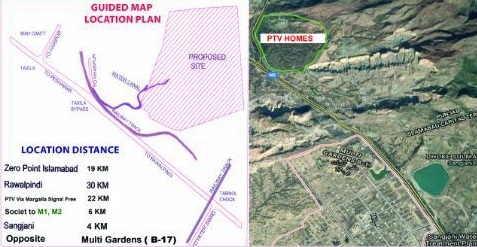 PTV Homes Cooperative Housing Society is ideally located close to sector B-17 Multi Gardens Islamabad, on GT Road. The location map is released, which shows the exact location right after the margalla hills to the right of GT road if heading towards Taxila from Islamabad. As you can see on the google earth map, the society location is marked in the green circle. Surprisingly, the location falls under Islamabad Capital Territory limits as per Google Maps, therefore it should essentially fall under CDA, possibly in sector A-16. 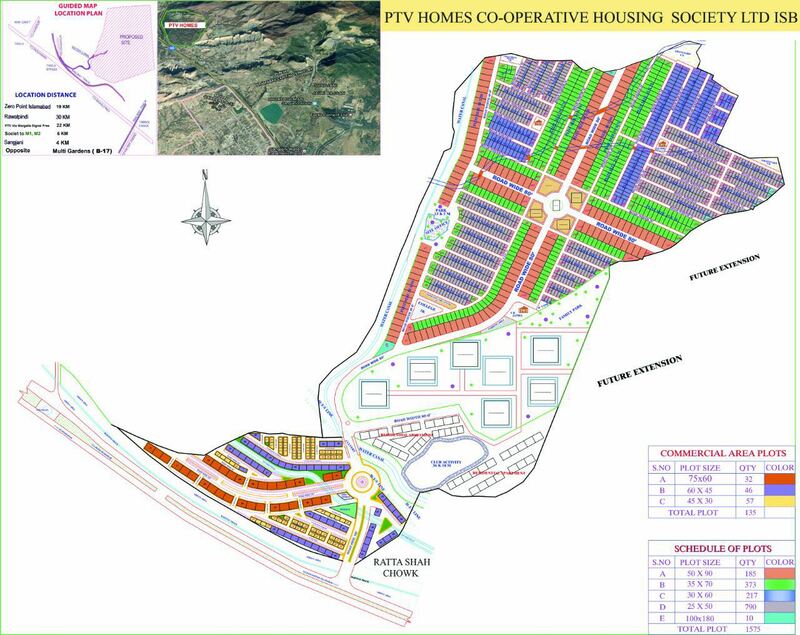 As you can see on the map above, different sizes of residential and commercial plots are mentioned with total number of plots in each category. There are some areas marked as future extension, which means that society has acquired or still acquiring lands around that area in order to launch new blocks in future. PTV Homes housing society offers 5 years easy installment plan, whereas possession of plots will be handed over within 2 years. Prices are very reasonable, and most importantly, development charges are included in the plot prices. The society offers 10% discount on full payment at the time of booking. Category charges will be additional to the given plot prices, i.e. main road plots will cost 5% extra, corner plots will cost 10% extra and corner + boulevard plots will cost 15% extra charges. Those who have already obtained the application forms can submit their forms along with mentioned down payment for respective plot sizes at society office. Those who do not have the application form, but want to avail this opportunity, they can simply buy an authentic application form from open market and proceed with booking. 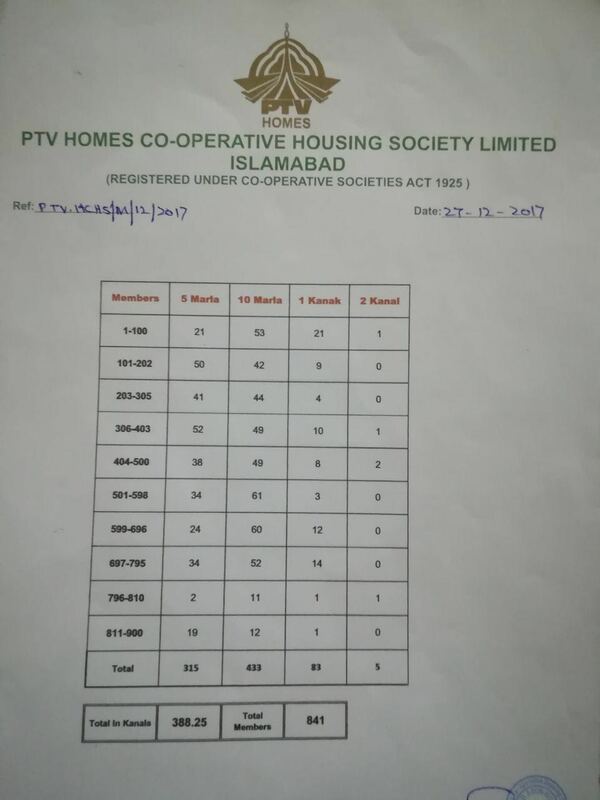 We will update this page as soon as we get some official source of information regarding PTV Homes Housing Society Islamabad, so stay tuned !